WarriorTracker.com brings advanced performance tracking, analytics and social networking to the Training For Warriors community. Perform today’s official TFW workout along with the rest of the community. Easily choose from exercise variations and alternates. Track your progress historically. Every workout, every set, every rep. Earn achievements for volume and consistency based objectives. Connect with the growing TFW community, and exchange workout tips and words of encouragement with other members. Martin Rooney is an internationally recognized fitness expert, best-selling author, and sought-after presenter. A former US bobsledder, Division I track athlete, and physical therapist, he the creator of Training for Warriors. In his ceaseless attempt to educate and inspire, Martin constantly travels the world to conduct seminars and spread his positive message about the importance of fitness. Now, Training For Warriors has almost 200 affiliate locations in 25 countries and thousands of people per day are using the TFW System to Bring Out The Warrior Within. 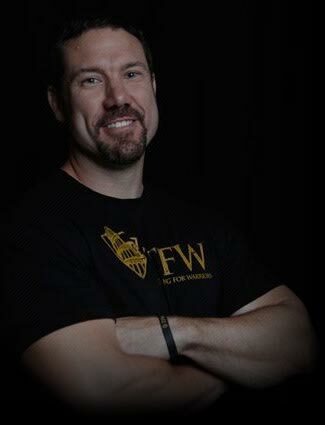 Martin has shared the TFW mission with Fortune 500 companies such as Marriott International, NIKE and Hasbro, Military Organizations like the Army Rangers and Navy SEALs, professional teams including the NY Jets, Cincinnati Bengals, Carolina Panthers and NY Giants, and universities such as Alabama, Arizona State and Oregon State. Over 3,000 coaches and trainers have been certified in the TFW System and Martin is looking for passionate fitness enthusiasts to become part of the global mission. When you're on FIRE, you have no choice but to make everyone around you burn. for they may become the guides to your greatest strengths. Lift heavy and sprint. Any questions?